Summary: Comparison of two 900SS fitted with 39 and 41mm Keihin FCR and a discussion of FCR versus the original Mikuni 38mm CV. I bought a set of 39mm Keihin FCRs to fit to Minnie, the 600M with the hot 750 motor. But circumstances weren’t really on my side to allow them to be used. So I sold them to a man with a 900SS who rang and inquired about fitting a jet kit. My playing with Minnie, along with the playing a customer named Tony was doing with his 900M (ported, hi comps) had bought out the inherent issues with trying to take a CV (constant velocity) carburettor and make it into a performance piece. Mostly centring around the fact that without an accelerator pump the Mikuni require either rich pilot jet or rich needle settings to give good performance when cold. The fuel economy on my 750 would vary up to 20% from one size pilot jet to the next or one notch difference on the needle on commuting. Personally I didn’t do much riding other than that, but Tony with the 900M does a lot of back roads riding and he chased all sorts of flat and “not quite right” spots with a variety of jets, needles, slide springs and settings thereof. The fact he’s one of the most hands on owners I’ve come across means he tried lots of stuff. All to come to the conclusion he’d be better off with some FCR. So he bought some. Actually, I believe his wife did. He had previously owned a similarly modded 900SL fitted with FCR 39 and had spent quite a bit of time tuning then on the road, so he had some prior experience for fitting the 41mm to his 900M. In the end he ran the same jetting as he had on the SS with 39mm  160 main, std needle on the sixth notch, 52 pilot jet. Doug Lofgren does a jet kit for the Mikuni that involves fitting an emulsion tube in place of the “air jet” in the jet holder. It does work very well and is very responsive, even with std slide springs (std heavy springs - the horror!). But even though I have all the stuff to try it I just don’t have the time to get near something like that on my own bike. So I figured I’d give the FCR 39 a whirl, but didn’t get to that either. But I did get to fit them to a 900SS, and have recently done another 900SS with FCR 41. Which is what this report is about. The first 900 (“Michael”) came in with Staintune slip on mufflers, a K&N air filter and std air box lid with the snorkels removed. 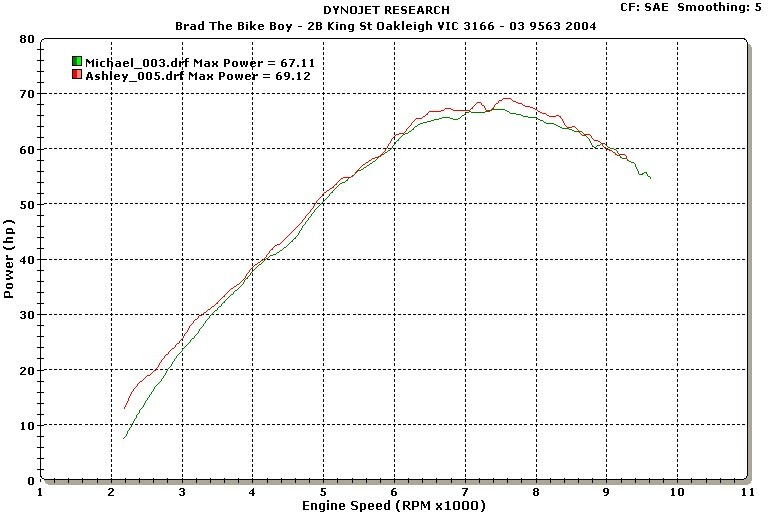 It was the first bike I’d run on the Dynobike’s new Dynojet 250 and the power readings on this dyno are a bit lower than the previous one. So we can’t really compare these runs to previous 900SS I’ve run. Also it was a bit lean, as I expected with the snorkels out. Since running this bike I fitted a lid without snorkels to my 750M to replace the full open lid and was surprised by how little difference it made, both to noise and performance. So with the snorkels removed the larger holes must give enough extra airflow to have almost the same performance as an open lid, but without being that lean (or more to the point, without upsetting the carbs that much) that it all falls over when you open that throttle fully. Although it’s still too lean for max power. The second 900 (“Ashley”) came in with old Gia.Co.Moto slip on mufflers  the ones where the mufflers slip on to separate pipes held on by springs, std air filter and an open air box lid. For the baseline dyno run I fitted the K&N filter from the FCR kit and the std lid without snorkels from my 750M, meaning that apart from muffler brands it was pretty much identical to the previous 900. The only other difference was that this second 900SS was in fact a 900SS SP, one of about 20 (from memory) bought into Australia in late 1995 (to fill a local shortage of 900SS?). Spec wise for us it was the same as the 900SL, but with a dual seat. So it has USA spec carbs  different needles, same main jets, and some different internal drillings. 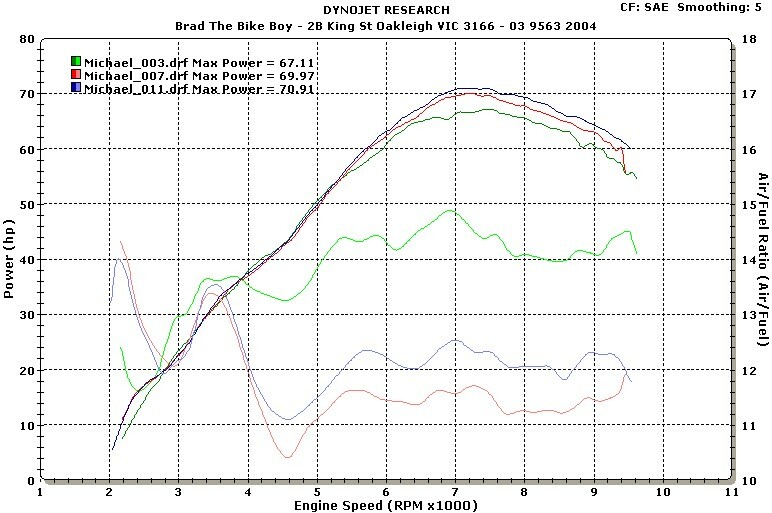 The first graph compares the two with std carbs. Power first, then torque and air/fuel. As you can see, the second bike has a slight advantage in the as was configuration, But the fuelling, once the slides have lifted fully, is about the same and clearly too lean. This is the reason I set both up as similarly as I could, simply for consistency in the test rather than a correct result. I see the fact that both air/fuel traces are equally bad as a good result. The jagged peak area of the second bike may be related to the carb internal passage sizes, my 600 carbed 750 shows similar things compared to a 750 carbed 750. So both these bikes would probably make as much or more power with a std air box lid, and that’s how they felt to me on the road. The first bike got FCR 39. When I dynod the first bike I started out with 160 main jets that Tony was running. As they were clearly too rich we tried 152 mains. 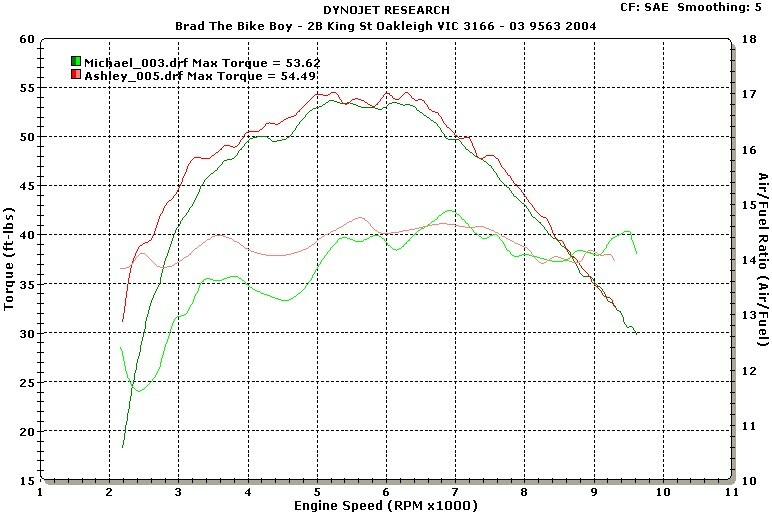 Based on that result I fitted it with 150 after the dyno session was over. 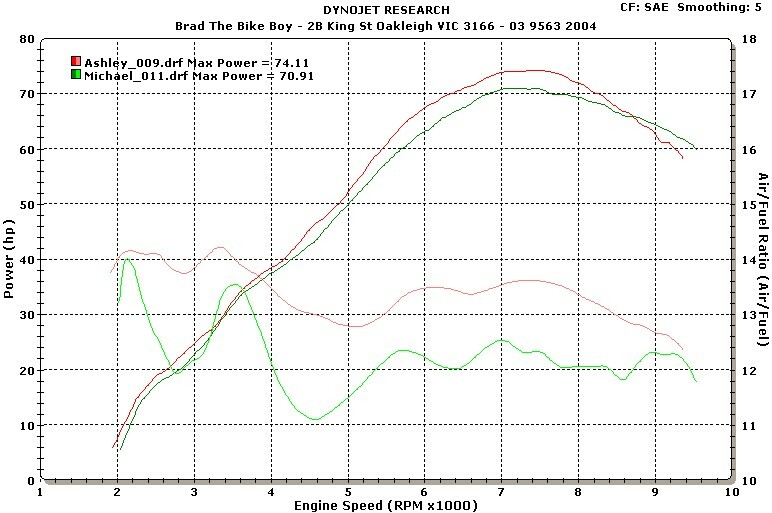 The next graph shows power and air fuel for this bike - before in green, FCR 39 with 160 main jet in red and 152 main jet in blue. 12:1 air fuel ratio is still too rich, but I like to see 12.5  12.7 and figured 150 mains would get me there. The second bike got FCR 41. When I dynod this bike I fitted the exact same 152 mains as I had used for the 39 dyno runs. Again, power and air/fuel, green before, red after. As you can see, the jagged curve around the power peak is now smooth. You can see the 152 mains give 13.5ish air/fuel ratio in the 41 compared to the 12:1ish on the previous bike with the 39. I had a conversation with JD Hord about his experience with FCR jetting and this 39 to 41 mixture difference backed up his experience and he mentioned Bernoulli’s equation, which I remembered somewhat from my fluid mechanics classes. So I Googled it to refresh my memory and ran some numbers. Turns out the 41mm carb has about 11% more flow area, which for any given flow should give 11% lower air velocity. Pressure differential is proportional to velocity squared, whereas flow differential (fuel up through a jet) is proportional to the square root of pressure. Which leads to them cancelling each other out and giving flow inversely proportional to area. Meaning the 41 should be about 10 or so % leaner than the 39. By the dyno results it’s about 15%, but the numbers seem to work fairly well using the well founded engineering principles of assuming whatever you need to to make the numbers work. Of course, if I made any gross errors someone will hopefully point them out. Comparing the two with FCR fitted shows this mixture variation more clearly. Again, I will stress they are running physically the same jets. I’m not sure why the 41 bike losses its power faster past the peak than the 39 bike. Maybe it has had the cam timing played with at some point, as the shape of the curve is consistant with advanced cam timing. I can’t imagine it’s related to the FCR at all. The mixture is heading rich, and rich mixture on the dyno does tend to hurt dyno power. But it’s no richer than the 39 trace, although perhaps it’s more the change in mixture as the revs climb that is affecting the curve shape  the richer it gets, the more power it comparatively looses, so the worse it looks. Perhaps a larger main air jet would help flatten the curve at the top end, but then you’re getting into somewhat more involved tuning. This graph bears out one thing  there is no WOT midrange deficit with the 41 compared to the 39. How they compare on the road in hard riding I don’t know, but neither of these bikes felt flat to me. My customer Tony feels that the 41 have a comparatively slower (smoother) response from a closed throttle than the 39, which in his opinion makes the bike easier to ride hard. Showing a before and after graph for both bikes together it’s clear that the increase of the 41 bike is more than the 39 bike. Not very much, but there’s no benefit of the 39 over the 41 in WOT power anywhere in the power range that I can see. Blue is 39 before, purple 39 after, green 41 before and red 41 after. I changed the jetting a little on both of these 900SS. Std jetting on the Sudco FCR kits (both 39 and 41) is 155 mains, 200 main air jet, 60 pilot, EMT needle on the third notch, slow air screw 1 1/2 turns out and slow fuel screw 3/4 turn out. On the 39 bike I ran 150 mains, 55 pilots, needle on the fourth notch and wound the slow air screw in 1/4 of a turn. On the 41 bike I ran a 52 pilot and everything else as delivered. To my memory it ran better at low throttle openings than the 39 bike and was far easier to affect a good result. I go down on pilot jets as with the std 60 they get very rich at idle when hot. They do start well though and perhaps not so well when cold with the smaller pilots. I have found that the idle mixture is much richer than I usually run (7 to 8% CO), but that’s what they like and changing it impacts low speed running. For starting I recommend winding the idle speed screw in a turn or two, opening the throttle fully twice then cranking it without touching the throttle. Let it run for a minute or so then it will happily accept throttle. Works in my experience on a sample size of two. But there’s better info out there on basic set up and tuning them from Chris Kelley (who I buy them from) and Patrick Burn’s excellent guide to tuning FCR as below. I use both of these. So I don’t know if this has helped with the 39 or 41 question. There seems to be lots of very passionate opinions on this one, but I think I’d go 41 again. I don’t believe that the 39 offer a midrange advantage, or 41 are only for bikes with mods. Although JD Hord prefers 39’s and he has much more experience tuning them than me. The main point I have found is that feedback from the owners seems to reinforce the view that either is a great mod compared to the std Mikuni CV carbs, so without trying both on the same bike I don’t think there is a definitive answer. I’ve seen a couple of instances of those who have, and the conclusions there seemed to be 39 although 41 may be easier to tune. Bit like the oil or tyre or spark plug debates. Michael, the owner of the 39 bike, said it was more responsive, nicer to ride (especially at low speed), had a better top end and just better all round. He used the word “sensational” quite a few times. Ashley, the owner of the 41 bike, expressed concern about the life of his rear tyres. Neither seemed to have any complaints.